Chuck her into the corner..
Shootin’ the Breeze – here is Steve McQueen and what looks like Bud Ekins talking off road maneuvering whilst sitting astride a pair of Triumph desert sleds. 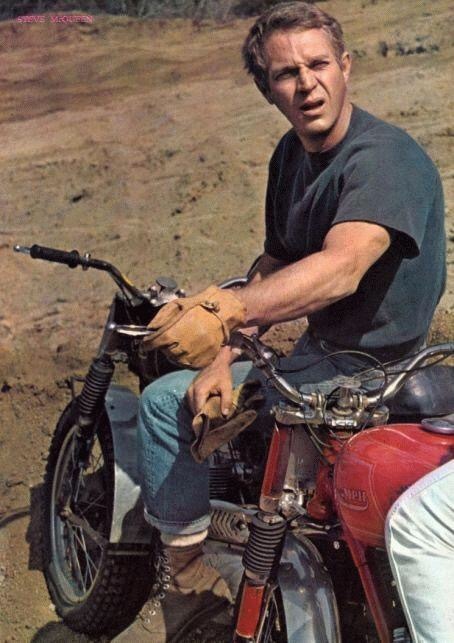 Steve is wearing his Hilts top that he wore in The Great Escape so this is around 1963. Great photo. Family Values – The McQueens looking good on one of dad’s Triumphs. Chad, Steve, Terry & Niele. 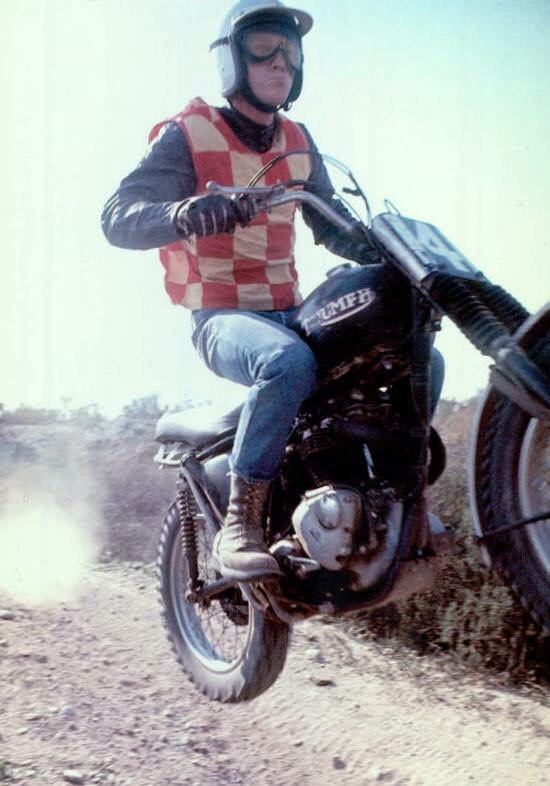 On Any Sunday (1971) by Bruce Brown, who passed away yesterday at the age of 80, is considered the very best documentary that covers motorcycle racing action in Dirt Track, Road Race, Moto Cross, Hill Climbs, Bonneville Salt Flats World speed records and more. 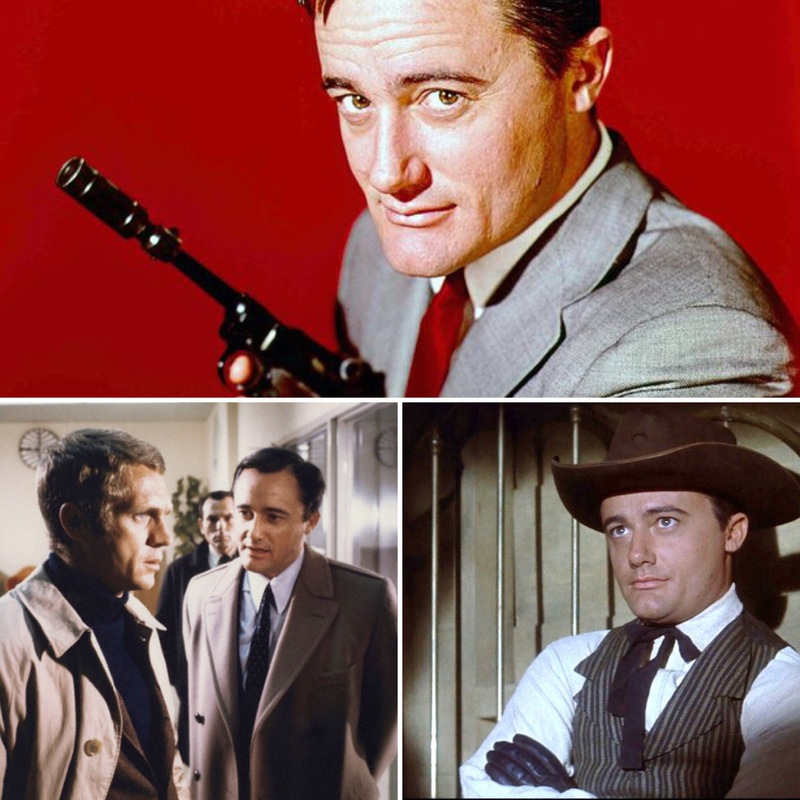 The movie stars Steve McQueen (who also backed its production), Malcolm Smith, Mert Lawill and Gene Romero. At nearly 50 years old, it still remains as a “MUST SEE” required viewing if you have anything to do with motorcycling. 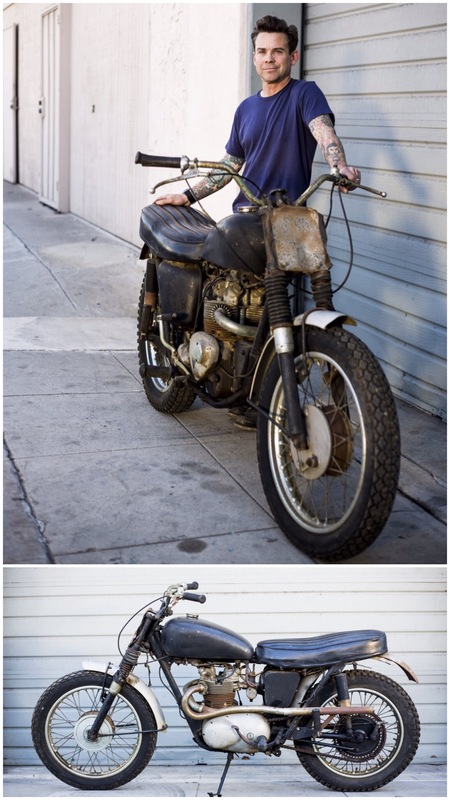 Sled – Glory Motor Works owner Justin Kell standing with a ’64 500 Triumph. Found in a dusty south California aircraft hangar it was determined to be one of Steve McQueen’s desert racers. There is talk of restoring it; I would hope they’d keep its aged patina and stop further corrosion, wipe the engine down with an oily rag, get the engine sorted to run like a champ, new Dunlop tires, and take it to the Mojave. 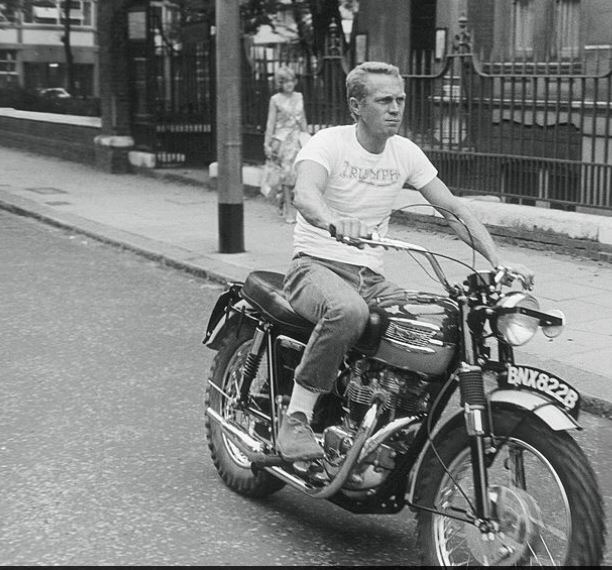 The Dudley Dude – a factory fresh Triumph TR6 being taken for a cruise around the Streets of London. 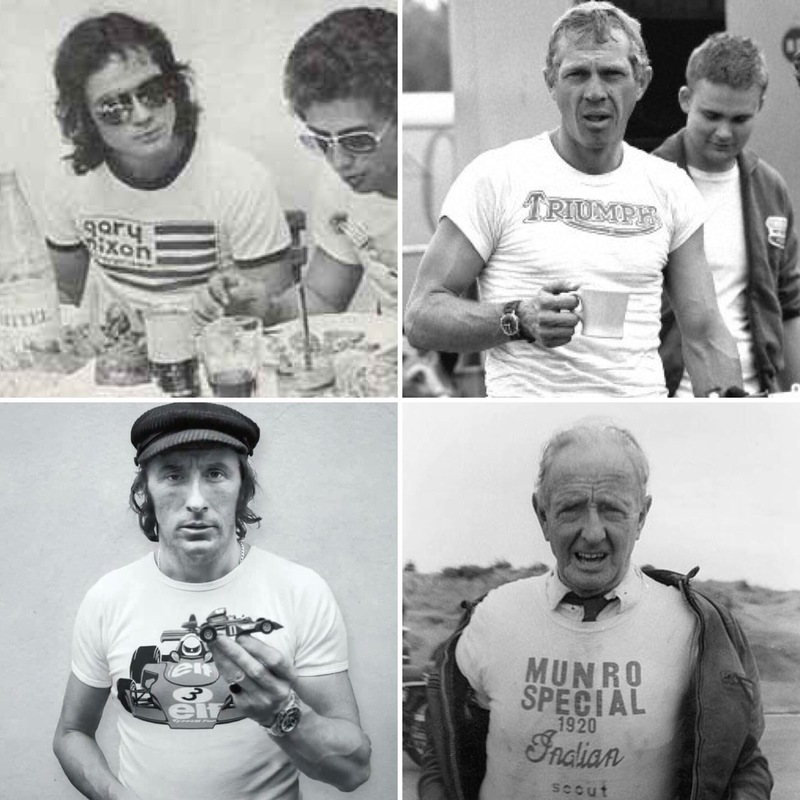 To mark Steve McQueens Birthday here he is in his element looking cool: desert boots, jeans and Triumph tee-shirt. This moto was his number 278 steed for the upcoming ISDT that was held in East Germany. Year is 1964. B reg plate. NX designates Dudley registration.